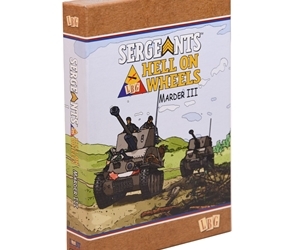 The Sergeants Hell on Wheels Vehicle Modules are playable with either Sergeants D-Day or Sergeants Miniatures Game. The Marder IIIM Vehicle Module requires Sergeants Hell on Wheels for play. 48 cards for the 4 crew with their action cards and special training cards. Status Markers for "dismounted" crew, mines and MG42.